They are everywhere you look. On land or in the air, six-legged insects and eight-legged arachnids are ubiquitous. This made insects natural test subjects for the Monster Maker of North Korea. And as kaiju appear in the wild many of them are insects. Even the colossus of America has been crippled by an explosion of mutigiant bugs. This sourcebook details the history and abilities of these resilient creatures, and provides detailed statblocks at multiple power levels, each one ready to run right off the page. A sneak preview of "Fate of America", which pits the people of the U.S. against devistating armies of mutigiant insects. New kaiju Mutations, such as “Colony” and “Multi-Legged”. For a limited time get 5 "Big Books" for the price of 4 with the "Kaiju Summer Season Pass"
The season pass Zip file has been updated with Insects. Sorry for any delay. It may have been updated, but the link in my Library isn't working, and I can see no way to download the books. How do I get them? If you go to your "Library" you can find all the items that have been Updated. The Season Pass should be there for you to download. The season pass does indeed show up in your library, but as Chris says there is no way to download it. 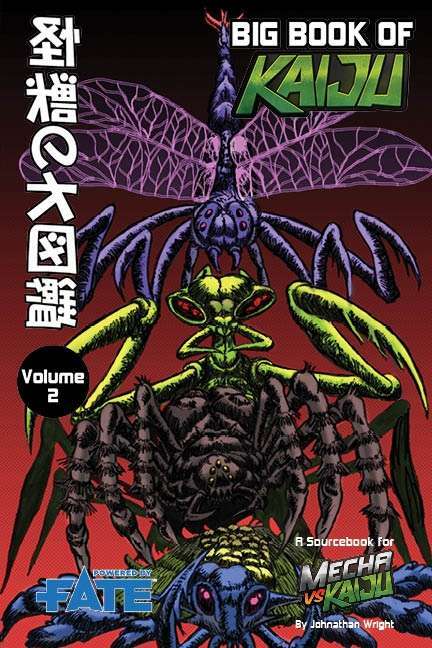 Furthermore, Big Book of Kaiju - Land shows up separately in my library, and I can download it at will (and going to that product's page, I am told that I've purchased the product & can click to get it), but BBoK - Insect does not. Just checked today, and I was able to download the updated season pass (including Insects) from my library. Thanks much! Yes, the season pass is finally fixed. Turns out we all stumbled on a bug in their system. I'm the same as Chris H. More than a month has passed and the only thing that has happened is that the Kaiju Summer Season Pass has disappeared. So, I bought the Kaiju Summer Season Pass. How do I get this book? The season pass shows up in my library, but there's no download link for it.